Patrick Carman's Dark Eden is a provocative exploration of fear, betrayal, memory, and— ultimately—immortality. Review: Patrick Carman takes a reader on a scary adventure through Eden- where fear is the cure. Dark Eden is told through the view point of a fifteen year old named Will. Will is made to meet with a counselor, Dr. Stevens, who helps people overcome their fears. But Will isn't like most people who Dr. Stevens helps; he is 1 of 7 in which they need more help than she can offer therefore, she suggests attending a week at camp Eden. Seven teens who all have something in common coming to one place for an entire week to be cured- no one knows what will happen... well almost no one! Will Besting has a secret and throughout the book, since it is told through his viewpoint, the reader knows what Will's secret it- we know what he knows and the information that he is willing to share with others... but at the same time the reading is alongside Will we are caught wondering & questioning the things that he doesn't know. So the reader really gets a chance to feel like they "are" Will Besting! Dark Eden is suspenseful and creepy throughout- but the plot all unfolds towards the end. Most of the time I'm partial to books like that- but it works well in Dark Eden. There is a stable storyline with little surprises that occasionally occur as Will begins to figure things out-- But in the end, there are twists and turns that I did not see coming! The trailer to me was scary, but I wouldn't say the book was scary, it was more suspenseful than anything. To me, I was always apprehensive about Dr. Rainsford ( the doctor who helps cure the seven teens) but I wasn't sure why I felt this way. So the end made me say "ahhhh ha!" oh and let's not forget the slight love interest that goes on in Dark Eden :-) I loved being able to understand what Will thinking about when it came to Marisa- it is usually the girls point of view and how they admire someone, so I'm glad we got to see a bit of a guys side for once! The neat thing about Dark Eden is that Patrick Carman designed this book so that readers have a chance to interact using an app on their phone or Ipad- it is android of Iphone compatible. I downloaded the first chapter on my phone; and I will say that it does require lots of memory! I ended up having to remove a few apps to add Dark Eden. But, it is worth every bit of memory it takes. The application allows a reader to feel as if they are a part of Eden- I was better able to understand where I was at with the book in terms of rooms and how the layout of the area is. I was very excited to take the Dark Eden Fear Test, what I didn't realize was that it would tell me my fear before I could get through it. The truth is, my fear is people or things jumping out at me-- so I had to stop the fear test because I was too scared. BUT, for those of you who like creepy things, go on and take the Fear Test!!! 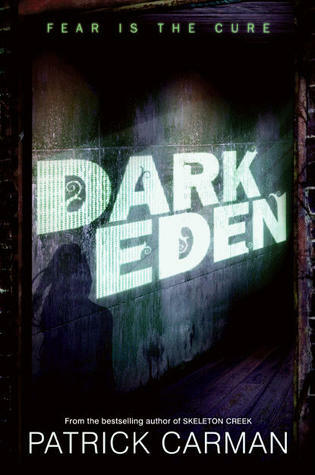 I would recommend Dark Eden to any teenage or young adult reader! Especially those who enjoy psychological thrillers (although I wouldn't quite classify it as that, it does play around with your mind ;-) and suspense. I just finished this yesterday and I loved it! I loved all the interactions and images on the web sit it really sets the mood. Glad you enjoyed it too. HAHAH! I was screaming throughout the whole darn thing. But I made it through. Nice review Andrea!! Are have a great doubt about is immortality is possible. Anyone knows the secret of immortality. Immorality is the indistinct persistence of a person’s existence, yet after death. Looking for a thriller with a twist? Carmen cures your fears, and leaves you with mysterious side effects. Great early Teen read.